Sedans just may be the automotive deal of the month. As truck and SUV sales continue to soar, Bay Area bargain hunters are snapping up popular, gas-sipping, 4-door cars by the truck load. The “other” Japanese automaker continues to impress those who may be sitting on the manufacturer’s fence. Yes, Honda and Toyota continue to sell big, but who doesn’t like pulling for the little guy? 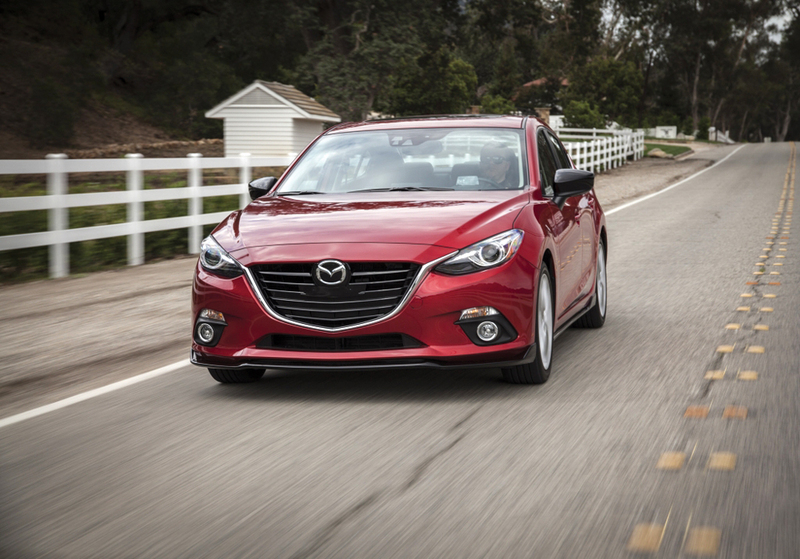 The Mazda “3” has been refined to the point that it now easily competes with the mega-makers. We’re talking a sleek, wind-cheating body with an appealing grille. There are 3 trim levels available, 3i Sport, Touring and Grand Touring. Several optional equipment packages compliment the 3 trims. The interior is well laid out, inviting and comfortable. A touch screen sits atop the dash but you’ll have to use a knob on the center console to control it while the vehicle is in motion. Ugh! The Mazda 3 offers two engines, a 2.0-liter or a 2.5-liter, both 4-cylinders. The latter boasts 185-horspower. A six-speed manual or automatic is available depending on the model. The smaller power plant delivers an impressive 29 mpg-city and 41 highway and the 155-horses has more than enough oomph to get you up to highway speeds in no-time. Hey, wait, Korea has something to say in this buyer-battle. Elantra enters the ring in the midsize class. It’s a wee bit larger than the compact Mazda 3, but here is another contender in the bargain fray. All-new from the ground up, this 2017 model may have you scratching your head, wondering how Hyundai offers so much for so little. 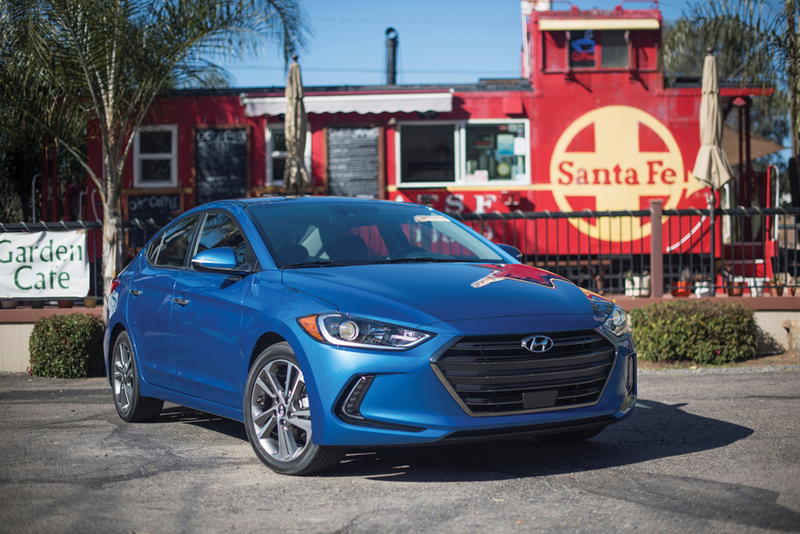 Looking more like its bigger brother, Sonata, the Elantra boasts a large, sharp-looking grille and vertical front marker lights with faux brake ducts. The interior is straight forward and can almost be stark-looking on the entry-level model SE, depending on options. Bump up to the Limited and you’ll feel like you’ve won the lottery – well, almost. A 7” touchscreen, Android Auto, Apple CarPlay, dual automatic temperature controls and power driver’s seat are just a few of the standard features on the Limited. Under the hood is a 2.0-liter 4-banger that delivers 147-horses and gets 28-city and 37-highway when connected to a 6-speed automatic transmission. A manual is also available. 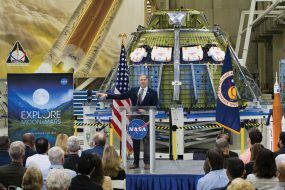 Pricing begins at $17,150, $100 less than last year’s model.